The gray, 10' L-4E6S Star Quad XLRM to XLRF Microphone Cable from Canare is especially designed for handheld microphone applications in live sound, rehearsals and other situations. 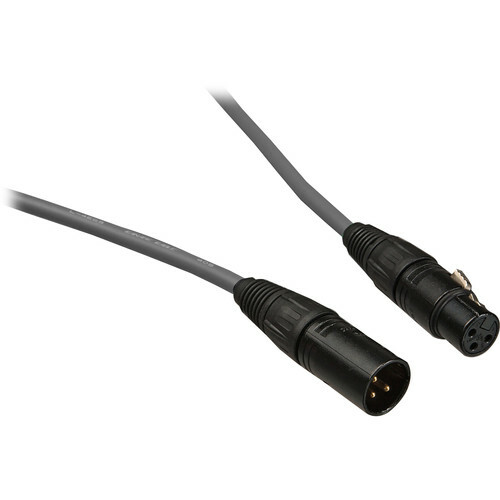 In addition to mic-level signals, the cable can also be used to carry line-level signals such as for connecting your mixer to power amps. Box Dimensions (LxWxH) 5.8 x 3.9 x 0.7"
L-4E6S Star Quad XLRM to XLRF Microphone Cable - 10' (Gray) is rated 4.8 out of 5 by 10. Rated 5 out of 5 by Jeremiah from Love the color coding Sam Mallery who makes a lot of technical videos for B&H recommended these videos at his blog (what to get for an audio professional). The manufacture seems top notch and I love the ability to match mics to my mixer using color coded cables. And hey, who doesn't like a little color. Ask me in five years how durable they are, but the specs are top notch and the components name brand. I'd rather not worry about my cables on a shoot. Rated 5 out of 5 by James A. from Great cable but watch out for the color if visible to camera The cables function well as do all the Canare cables. The only issue I noticed is that when I used the color coded cables to my mics, when the mic stand showed in the video the combination of the red and blue cables made the stand extremely noticeable due to the intense purple color that resulted from the red and blue in proximity. I won't use anything but black in any area that might be visible to the camera again. Rated 5 out of 5 by Vijoy from Excellent 5-star cable Excellent cable with excellent connectors. Excellent performance, easy to handle, Highly recommended, overall excellent product. Rated 3 out of 5 by Adam from Gets the job done This charger is good, but not great. The indicator light is only ever red or green, meaning there is no indication of charging progress (blinking patterns, different colors, etc). The interchangeable plate that it comes with tends to come off with the battery, which is a result of poor design. I appreciate that the plate is removable, but I wish it would attach more firmly. Rated 5 out of 5 by Charles from Great Backup Cable for Sound Mixers I find the length on this just right for Sound Mixers that are also the Boom Op and have the bag on them. I wear this cord from the mixer over my shoulder to the boom pole and it's a good length that doesn't get in the way too much. I use this cable as a backup in case my coiled cable goes out. Rated 5 out of 5 by Gabe from Solid cord. Does what it should, and well. Great cord. I use it for my Rode NT5 mics recording live shows and some in-studio performances. Have never had trouble with line noise, or faulty connectors. Plus with the white and gray ones I got, they never get mixed up and accidentally taken. Rated 5 out of 5 by Charles from Perfect XLR Cable This cable does exactly what I need it to do, running from a shotgun microphone / boom pole to my recorder. It connects easily, makes no noise, and its blue!Note: 10 feet doesn't seem that long for cords, but in my case it works perfectly. Rated 5 out of 5 by Adam from The best cable for video production I use this cable for booming when I have my recorder hanging around my neck. The cable is flexible and easy to coil. The connectors are solid and can be color-coded with the Neutrik XXR color coding rings.